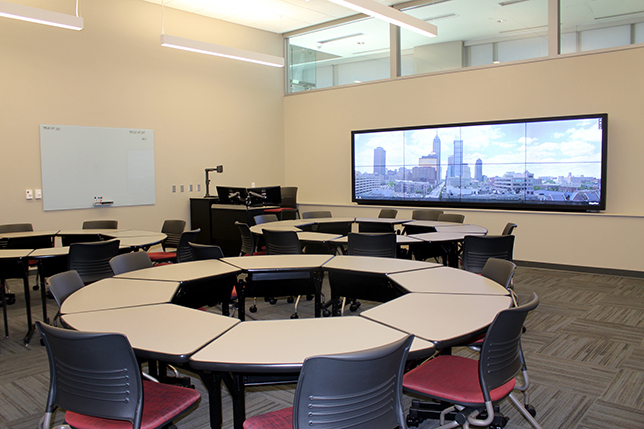 A recent learning space renovation at Indiana University focused on informal learning, collaborative technology and sharing ideas and content across multiple devices and users. On the surface, it's a simple statement — but in practice, it's something entirely different, especially when technology becomes an integral part of that space. When it works (i.e., when space design is thoughtfully planned out ahead of time), space can foster the transformation of the classroom from one-way communication and transmission of knowledge (the "sage on the stage") to a vibrant, active learning environment where all users participate and engage with the content. In fact, when technology is thoughtfully planned in alignment with space – and especially with the intent of solving a problem or encouraging a specific type of activity or behavior in the space – the technology complements the space design to create the possibility for a whole new paradigm shift in the way learning happens. When the intent of a learning space is to foster collaboration, that space must facilitate activities that optimize teamwork. In the past, however, such activities were often hindered by technology that was incongruous to the space in which it was installed — or even an outright barrier to collaboration. For example, a single display, connected to a single device, would restrict active collaboration to just the content of that device: There was no opportunity to synchronously share content from multiple devices. The only way to "share" content was to take turns connecting individual devices to the single monitor — a tedious process, and by any definition not a very collaborative process. Author Julie Johnston will present the session "The New Collaboration – Video, Interactive Mobile" at EduComm Expo 2016 on Wednesday, Nov. 16 from 10:00-10:50 a.m. at Chicago's Navy Pier. For more information, visit the EduComm Expo 2016 site. In various Indiana University classrooms, such "incongruity" was once very much in evidence. Clearly, a new vision for collaborative spaces was necessary, and one that would create equal access to all users by providing a mechanism for the sharing of all perspectives. It was quickly realized that a major component of this vision would focus on the personal mobile device: When such devices are leveraged in a learning environment, this "equal access" to sharing of ideas provides the framework for a whole new level of collaboration. The ability to wirelessly (and seamlessly) connect multiple or perhaps even unlimited users via their mobile devices helps create an environment where even the most reluctant introvert is inspired to participate. "This is the future of classrooms," said Stacy Morrone, IU's associate vice president for learning technologies. "We're moving toward models where students are doing more problem-based learning, working together in teams, and sharing what they're learning with peers and professors. This is the type of teaching and learning our new classrooms must support." A recent $21 million dollar renovation of Indiana University's Media School, housed within the historic Franklin Hall on IU's Bloomington campus, focused on fostering this type of learning in a space that invites collaboration and movement. To encourage group brainstorming, for example, the classroom space features a strategically placed glass whiteboard; after students collaborate on the board, they can instantly take pictures of their work with their mobile devices and share them wirelessly on an interactive video wall. The video wall was installed with a full glass overlay so that students and instructors can manipulate and otherwise interact with displayed content. Yet today's learning environment has expanded well beyond the traditional four-walled classroom. Informal learning spaces, external to the formal classroom, should become an extension of the overall learning experience. In particular, mobile devices can play a major part in facilitating this learning outside the classroom, as these devices accommodate learning wherever the user happens to be and via whatever type of mobile device to which he or she has access. What are these informal spaces? Universities and corporations are trying to identify those special areas and gathering spaces within (and beyond) their walls in an attempt to foster unscheduled collaboration, which often leads to some of the most valuable learning opportunities. Therefore, the collaboration infrastructure and tools supported within that infrastructure should be carefully selected to maximize these opportunities for spontaneous collaboration. Six different channels can be displayed at once on the video wall. Using the Tunity app, students are able to hear the sound from any of those six channels on their smartphones. The screen can also be configured to concurrently display several different images. Lecturers can use the video wall to display presentations and students can use it to display their work wirelessly in an open forum. Both students and faculty will be able to interact with the wall through a variety of inputs, including laptops, cable boxes, a live feed from the adjacent student control room and a gaming cart. To complement the school's gaming program, students will be able to showcase their creative game works by utilizing the gaming input and playing their game on the screen. One week after the grand opening, this space is has already become a hub of activity. It is creating a community of learners who will be inspired to share their creative works. 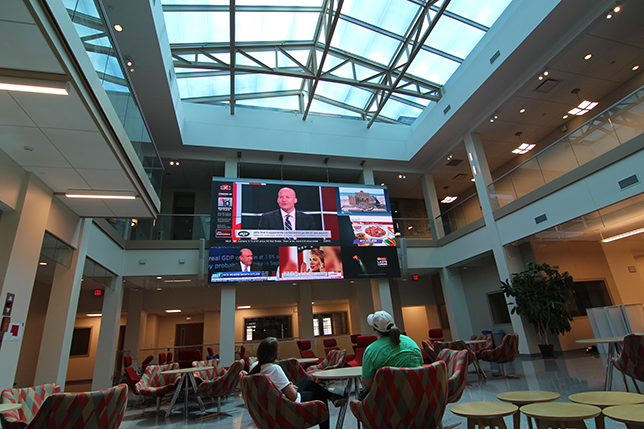 The innovative classrooms within Franklin Hall are designed to complement the offerings of the atrium video wall. A nearby showcase classroom is designed to replicate an interactive digital newsroom, where content can be projected and manipulated (via interactive touch) on the classroom's video wall to create timelines and storyboards during classroom projects. Whiteboards surround the room, and student tables with whiteboard tops accompany student displays where content can be shared wirelessly. Innovations in classroom video technology – especially in the context of lecture capture – also enhance instructors' ability to target specific content using sophisticated data analytics. For example, by analyzing trends in student views of specific video content, instructors can identify content that should be revisited in the classroom. While traditional one-way lecture capture provides recorded lecture videos to students, newer technologies also help expand the learning environment both in and outside the classroom. Moreover, the tools for video production have become user-friendly and many are seamlessly integrated into the learning management system — fostering a new form of collaboration that shifts the generation of content from the exclusive domain of the instructor to both the student and the instructor. The hurdles of the past — difficulty in manipulating large video files, lack of storage, bandwidth issues, affordability, ease of use and integration with the LMS — have been overcome. Today's instructors and students want to engage and immerse themselves in content. To meet this need, the focus now is on the "all-in-one" communications tools that provide extensive functionality but with an easy-to-use interface within the context of thoughtfully designed spaces. Spaces that intentionally design for this purpose will enhance and support the type of learner for the workplace of today and for the future.